More than ten members of the Estonian Society of Central Florida (Kesk Florida Eesti Selts) spent the weekend of December 10-11, 2011, making preparations for Christmas. On Saturday, December 10, Leena and Väino Aare of Bradenton, Florida, once again very generously hosted the verivorst-making party. Seven pairs of workers working serially successfully made nearly 100 sausages in just under 4 hours. At the conclusion, as is the group’s tradition, everyone celebrated Väino’s birthday with a beautiful cake and delicious kringel. The party was made even merrier with the arrival of Leena and Väino’s son and daughter-in-law and twin granddaughters. On Sunday, December 11, 2011, Kati Rausberg (from Tallinn) made traditional piparkoogid (gingerbread cookies) at the home of Lisa and Erkki Taada. Kati is a record-breaking three-point shooter on the Eckerd College women’s basketball team; she will be graduating in May 2012. After two and a half hours in the kitchen, Kati had a huge plateful of cookies to take back to share with the members of her basketball team. 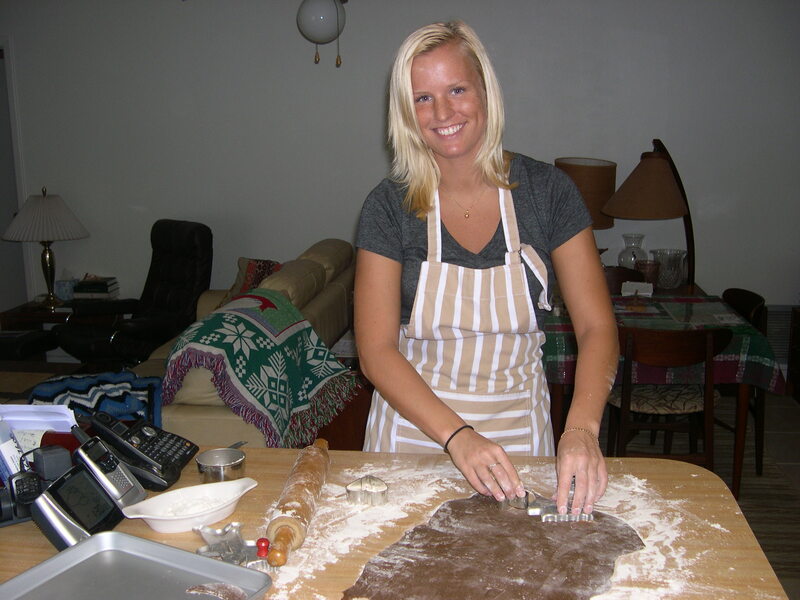 Members of the Kesk Florida Eesti Selts will continue baking in their kitchens over the holidays—they’ll be getting ready to offer kringel and piparkoogid during the coffee breaks during KLENK 2011, 6-7 January, 2012, in St. Petersburg, Florida. Come join us! Kati Rausberg (Tallinnast) makes piparkoogid. Kati is a record-breaking basketball player at Eckerd College, St. Petersburg, Florida, and a senior double majoring in International Business and Business Management.